One Savvy Mom ™ | NYC Area Mom Blog: All of your child's FAVORITE'S! In the all new Action Pack from HIT Entertainment! All of your child's FAVORITE'S! In the all new Action Pack from HIT Entertainment! Preschool pals Thomas & Friends™, Bob the Builder™ and Fireman Sam™are back with all their friends for new adventures everyone can enjoy. From engines having fun on the rails, to getting the job done with new construction projects or to saving the day with everyone’s favorite hero next door, there is no shortage of action and adventure here in the Action Pack 4 DVD Set from Lionsgate and HIT Entertainment. Any boy is sure to love the set, which is also perfect for Valentines Day or Easter gift-giving! Including two titles from Thomas & Friends, the #1 Preschool DVD and toy brand plus exciting adventures from the all-new CG animated series of Bob the Builder and Fireman Sam, HIT Entertainment continues to create entertaining content and rich characters that become lifelong friends to children. The programs encourage kids to explore their imaginations and the world around them and teaches early lessons to grow in both heart and mind. Thomas & Friends: Steamies vs. Diesels: On the Island of Sodor, two kinds of engines help keep Sir Topham Hatt’s railway running smoothly – Steamies and Diesels. But is the Island big enough for both? It’s not always easy for these engines to put aside their differences and work together. Will Thomas come to their aid when they need this Really Useful Steamie’s help? Get on board with the Steamies and the Diesels and see how they finally learn that, from brake pipe to buffer, all engines are more alike than not. Thomas & Friends: Track Stars: The Island of Sodor is always bustling with trainloads of work to be done, and keeping it all on track are the engine heroes! Can Thomas slow down? Will Emily deliver her passengers? Has Percy made a big mistake? Is anyone as bright as James? Find out as Sodor’s track stars ride the rails to adventure! Bob the Builder: Heavy Duty Diggers: Bob and the team are hard at work in their new location in Harbor Town where Lofty leads the construction of a new ocean pier and transforms an old shack into a surf school. Scratch is digging his way into all sorts of adventures with Scoop at the museum, and Scrambler attempts to build a tree house at the school by himself. So grab your hard hat and get ready to find out why the fun is in getting it done! Fireman Sam: Help Is Here: Join Fireman Sam and his friends as they make courageous rescues throughout the town of Pontypandy. Fireman Sam saves the supermarket on Fire Prevention Day, helps the rescue dogs find missing people, shares important safety tips, and makes a daring helicopter rescue in the midst of a forest fire. Fireman Sam is here to help you learn about fire safety, teamwork and having fun with your friends. B absolutely LOVE'S Fireman Sam, he has been a favorite in our house for the past year, and I love that the kid's on the show are learning safety tips and fire prevention as they watch this fun show! Thomas is also another favorite for B, put on anything that has to do with trains, and he's in! 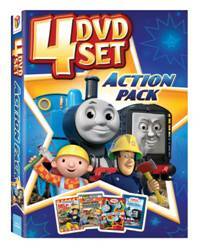 In these two fun DVD's Thomas and his friends learn to work together with friends to get thing's accomplished. Bob the Builder and all of his friends keep the message of working together going, as they work together and have fun working together to build the surf school. We had a wonderful time watching these action packed DVD's from HIT Entertainment, they would make a wonderful Valentines Day treat (also wonderful to add to any Easter Basket)! One Lucky Reader will receive a Action Pack! 4 DVD'S Include All of your child's FAVORITE'S! In the all new Action Pack from HIT Entertainment! Leave a comment~Which character from the Action Pack is your little one's favorite? The comment is considered your entry. We like Bob the Builder. My little one enjoys Bob the Builder. 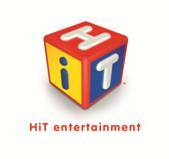 I follow HIT Entertainment on TWITTER 1. I follow HIT Entertainment on TWITTER 2. I follow HIT Entertainment on TWITTER 3. I follow HIT Entertainment on TWITTER 4. I follow HIT Entertainment on TWITTER 5. I entered your Big G® cereals & Hot Wheels EXCLUSIVE Super-Fan Family Prize Pack Giveaway 1. I entered your Big G® cereals & Hot Wheels EXCLUSIVE Super-Fan Family Prize Pack Giveaway 2. I entered your Big G® cereals & Hot Wheels EXCLUSIVE Super-Fan Family Prize Pack Giveaway 3. I entered your Big G® cereals & Hot Wheels EXCLUSIVE Super-Fan Family Prize Pack Giveaway 4. I entered your Big G® cereals & Hot Wheels EXCLUSIVE Super-Fan Family Prize Pack Giveaway 5.